It is time to re-discover Kaizen and Kaizen Spirit, and renew confidence in our abilities and the future. 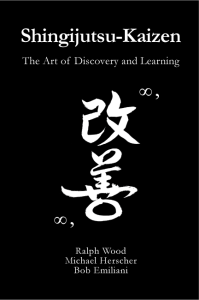 I, along with my co-authors Ralph Wood and Michael Herscher, are extremely proud to bring to you this very special new book: Shingijutsu-Kaizen: The Art of Discovery and Learning. It is a book about how sensei from Shingijutsu USA Corporation practice Kaizen and the innovative approach to discovery and learning that they impart to their clients. Through the voices of both Shingijutsu’s customers and senior sensei (teachers), you will learn about Shingijutsu’s time-tested philosophy and methods for rapidly improving processes, developing people, and how Shingijutsu has applied their methods to many different kinds of businesses worldwide: from hospitals to retailers, technology businesses, and, of course, manufacturing. You will learn the profound lessons that others have learned by working directly with Shingijutsu sensei. You will also learn how some of the methods used to improve processes have been misunderstood or misapplied by others and how to correct them. Fills a void in our understanding of the history and expansion of flow production outside of the auto industry, post-1987. Recognizes Shingijutsu’s pioneering role in helping people discover and learn the things necessary to practice flow production. Introduces Shingijutsu to people who have only heard of them second- or third-hand, or who do not know Shingijutsu at all. Clarifies the “tough love” approach used by Shingijutsu Kaizen consultants, and illustrates its effectiveness in helping people learn and develop Kaizen spirit. Shows that Shingijutsu-Kaizen is fun and engaging, which, in turn, results in widespread participation and rapid improvement. Shares the unique thinking and actions to create material and information flow. Helps people recognize that their understanding of Kaizen is likely to be substantially different and, therefore, less impactful in practice than Shingijutsu-Kaizen. The first part, Chapter 1 and 2, illuminates Shingijutsu’s culture: its philosophy, values, deeply-held beliefs; its artifacts; and its language. The second part, Chapter 3 and 4, examines Shingijutsu’s distinctive competencies. The third part, Chapter 5, 6, and 7, presents lessons in how Shingijutsu’s work plays out in practice. In these chapters, we present three case studies of Shingijutsu Kaizen with actual clients. The fourth part, Chapter 8, discusses “the basics,” and adds Shingijutsu’s philosophical perspectives to some of the important productivity methods and tools and seeks to redress some misconceptions about them. Chapter 9 addresses future challenges for business and society. This book is a humble attempt to share our understanding of the spirit, mindset, and methods of Shingijutsu USA and their approach to improving the human condition. If you get one message from this book, we hope you realize how unique and sincere Shingijutsu sensei are as they have worked to rid the world of waste while simultaneously developing human potential. We hope you are likewise motivated to engage in this virtuous effort. You will also surely find another book, Kaizen Forever: The Teachings of Chihiro Nakao, to be a helpful companion to Shingijutsu-Kaizen.